“I’m certain I’ve never seen it before,” Daphne says, but I have — a bunch of times, back in 1967. But Dark Shadows has been looping in strange circles lately, since they went to 1995 and back again. 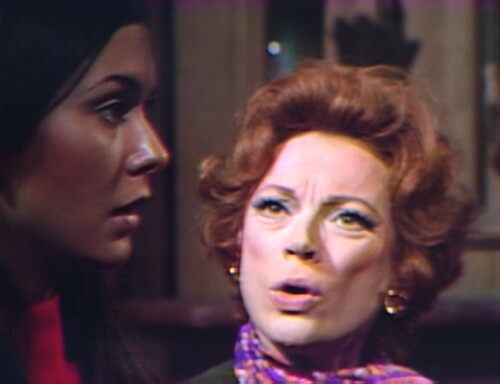 They’re currently giving us a mash-up of the 1969 “haunting of Collinwood” story and the 1967 “Maggie’s abduction” story, with a dash of 1897 “Petofi’s magic touch” thrown in. It’s been a while since Julia picked up the medallion and hypnotized us all into watching daytime television, but the ratings are slipping and maybe we could use a refresher. Daphne tries, and apparently she accomplishes it, which is better than I’ve ever been able to do. I’ve been looking at this show about as closely as it’s possible to get without banging my head on the screen, and if there’s any recognizable shape to all this, then it’s news to me. And it seems like things might get even more perplexing than they currently are, because yesterday was Joe Caldwell’s last day on the writing team. Caldwell has been filling in as the third writer since Violet Welles left the show back in April, but apparently he’s got a limit, and yesterday was it. From here on, the three-person team becomes a two-person team — just Sam Hall and Gordon Russell, typing furiously for the last six months of the show. Although I’m not sure that we’ll notice that much of a difference, because nobody’s really been on their game lately anyway. For a long stretch of the series, you can tell who’s writing the episode by listening to the dialogue — Sam Hall’s well-hidden nastiness played as wit, Ron Sproat’s ill-fated attempts to slow the show’s roll, Gordon Russell’s dialogue filler, Violet Welles’ character-defining screwball asides. But lately, everybody sounds the same. Hallie is just as annoying in one episode as she is in another, whether it’s Hall, Russell or Caldwell. I don’t really pay attention to who’s writing the episode anymore; they just sort of happen. Still, giving Hall and Russell 50% more episodes to write doesn’t really help the show get through this rough patch. Everyone openly admits that they were running out of ideas during this period, and all they could do was remixes of old stuff. This would have been a great time to hire a new writer with fresh ideas, so why didn’t they get anybody to replace Caldwell when he left? Well, it might have something to do with how utterly baffling the current storyline is. It all centers around a quintet of ghosts from 1840, who have been coming to life in borrowed bodies. David and Hallie are possessed by the spirits of Tad and Carrie, Carolyn has merged with somebody named Leticia, and Daphne has apparently embodied herself from scratch, using household items found around the home. And then there’s Gerard, the pirate king, who keeps them all jumping. 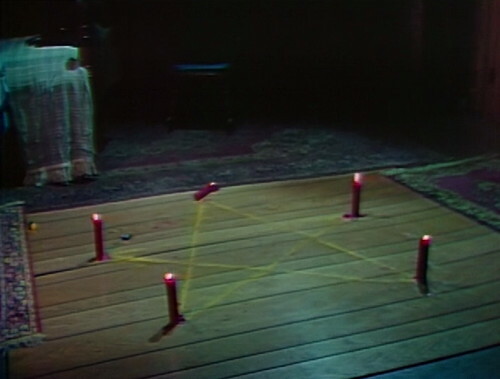 Julia’s found Daphne at Windcliff with David, who’s Tad, praying to the pirate’s star in a burning pentagram, and if that doesn’t make sense to you now, then there’s really very little that I can do. The important thing is that Dr. Julia Hoffman is improving the show by yelling at it. Julia: Unless something is done to stop Gerard, the house will be in ruins, the family will disappear, and the children will die! Daphne: Oh, none of that will happen, none of it, if you’ll just leave me alone here with the children tonight. At this moment, I’m the only hope they have of staying alive! Julia: You’re talking about Tad and Carrie. I’m talking about David and Hallie! Their lives must be restored! Daphne: There’s nothing I can do for David and Hallie anymore. Julia: There is a great deal that you can do to help! Now, I want you to come to the Old House with me, and tell me everything you know about Gerard, and the two children. (She sees Daphne hesitate.) The children will die. Quentin will be destroyed! Literally two minutes ago, Julia didn’t even know that Daphne existed on this earth, and now she’s bossing the ex-ghost around and criticizing her priorities. They’ve been keeping Julia in the library lately, reading diaries and chasing her own tail, making exactly zero progress in anything she’s trying to do. But now she’s got a lead at last, and she’s damned if some Charlie’s Angel is going to keep her from scowling the story into a higher gear. Daphne: If I go with you, what happens to the children now? Julia: They will remain here, and they will be well taken care of. I give you my word. Now, will you come with me? Daphne: All right. I’ll go. But I’m not going to let you destroy Tad and Carrie to bring David and Hallie back. Julia: (sighs) I think you want what is really best for the children. Sooner or later, you will help us, in order to allow them to survive. And that’s it, Daphne obediently marches out the door. Julia Hoffman is back in charge of the show. Television is always better when you put the smart characters in charge; they get bored and ask impertinent questions, which helps to drive the plot. Julia’s been on the bench for weeks, reading books and not learning anything in particular, while the ghosts slowly slipped the children’s souls out of their bodies. It’s been a rough period, but Julia’s finally got her hands on a decent informant. Check out how much tumbles out of Daphne, on the basis of an utterly ridiculous inquiry. Julia: Do you think Quentin is a reincarnation of the Quentin Collins that lived in 1840? Daphne: Dr. Hoffman, how could I possibly know that? Julia: Because you were in love with the Quentin Collins who lived in 1840, and you love this Quentin. Are they similar? So Daphne stands up, and sighs, and sings like a canary. Daphne: Well, the first Quentin was more of an aggressive man, with a will of iron. He led a very troubled life, and it was never very easy to get to know him. But the Quentin I know now is a gentler man. He’s easier to know… and to love. Well, that’s an unfortunate answer, because we’ve already seen an aggressive Quentin with a will of iron — in Parallel Time, where they succeeded in making their most charismatic actor into a boring jerk. I don’t want to go all the way back in time to meet another “troubled” Quentin, I like the one that we have. But apparently the one time period that Dark Shadows cannot avoid is 1847, and Jane Eyre. This is our fourth governess in the last four years, and guess what, Q40 is her Mr. Rochester. So we’ve got all of that to look forward to. But let’s head back to the center of the light, for the most baffling time trip of all. Julia’s twirling the hypno-medallion, and Daphne is ready to cooperate. Julia: Now, concentrate on the events that are destined to take place before the disaster at Collinwood. First, there will be a murder. Do you know who is destined to be murdered? Daphne: Destined to be murdered? Julia: Do you know who the person is? Daphne: Yes, I know who it is! So here’s my question: How? Because Julia saw Daphne’s ghost in 1995, and that Daphne could have told Julia what was going to happen in 1970, but this Daphne is currently in 1970, and as far as we know, she doesn’t have magical future-sensing powers. So what’s going on? Julia: What is the name of the person? Tell me! Who is it? Daphne: The person who’ll be murdered — is me! Julia: You? I don’t understand. Do you know how it’ll happen, and when? Daphne: The green flag will be waved in the window three times. Three times at the window! Julia: The window of the tower room! I saw the green flag there, when I followed David! When will this happen? Well, of course she doesn’t, because it hasn’t happened yet. What is the matter with you people? I mean, I get how exciting this scene is, dramatically. This is the moment that puts everything together — the ghosts, the flag, the clues — and naturally Julia is right at the center of it. See the way the light gives out? That’s Julia, at work. But I’m not entirely sure that the writers even realized that hypnosis doesn’t help people predict the future. At this point, it’s hard to keep track between 1967, 1847 and 1795, so who’s to say what’s the future, and what’s the past? Julia: Do you know if it’ll happen before or after the destruction of Rose Cottage? Daphne: First, Rose Cottage. And then — the murder. Julia: Then there may be time to save you. Do you know when Rose Cottage will be destroyed? Daphne: The destruction of Rose Cottage — will be tonight! So I think that’s the answer to the question: why didn’t they replace Joe Caldwell with a new writer? By this point, the show has drifted so far away from normal television that nobody else would even understand it. Imagine the onboarding process for somebody new — the tangled timelines you’d need to explain, in order to get them through their first week. Dan Curtis, Sam Hall and Gordon Russell know that the show is headed for a crash landing, and that’s not a situation where adding another person would help. It’s better to just brace yourself, and ride it out. 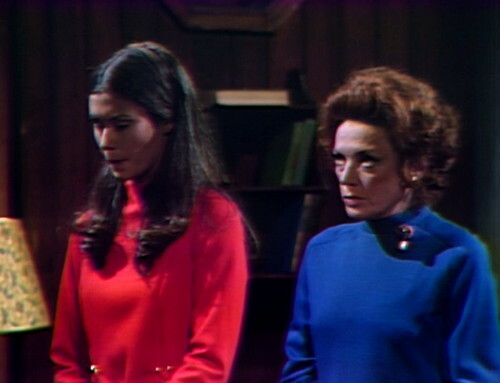 Julia asks Daphne who brought her back to life, and Daphne looks at the teleprompter for her response. 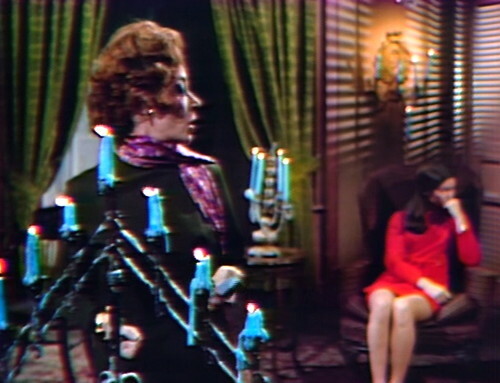 At the end of act 1, Julia and Daphne leave the room with the candles on the floor still burning. One of the candles has been knocked over, and its flame is very close to the edge of the Oriental rug. Why did the Windcliff staff leave Tad and Carrie alone in Tad’s room together? How did they escape? Tad just says, “Don’t worry, nobody saw us.” Are there any locks in this looney bin? I think you hit on two important points here: On-boarding and new ideas. On-boarding: Yes, they’ve written themselves into quite a tangle. They are losing longer-term fans and the plot is too tangled for newbies to take in. A) A jealous colleague from medical school slips Julia drugs to make her insane and he commits her to Windcliff, which he’s turned into his own little private house of experimental horrors. (Could possibly recast Maggie and Joe). B) Roger and Elizabeth’s surprise half-brother comes to town to lay his claim on a third of the Collins estate. In tow is a wife whose greed exceeds his and a son, about 18, who is slowly developing a hidden talent for reading emotions and thoughts (but the more he does it, the more he loses his own sense identity). Son falls in love with nice teen girl from the village that David likes, too. David’s early penchant for messing with car parts returns. C) Barnabas, Carolyn and Professor Stokes get a mysterious summons to an estate outside Boston. Turns out it’s Adam, now a wealthy lord of the manor. His physical scars are gone. But not the emotional ones. What are his intentions? And that of his business assistant, Mr. Yamata? I like option B. It brings conflict back in and the surprise relative is a soap opera staple. I’ve been saying David should have graduated to love interest plots by now. Could use the opportunity to bring back Victoria Winters, and with bite this time. Dan Curtis was very hands off with the show at this point, it could have been done. 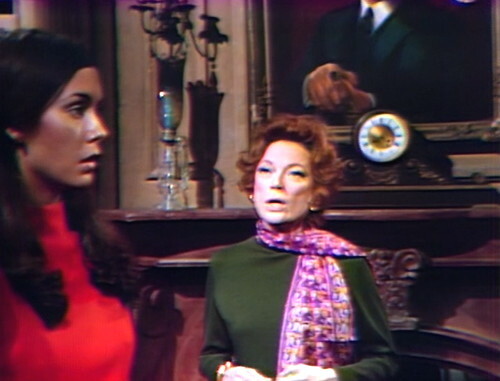 It’s telling both House and Night of Dark Shadows didn’t feature Vicki. Maybe the son falls for Vicki as people describe her, and that’s how she returns. ^ I like that. Adds in the supernatural element. William, I like all three of those plot elements. I agree, there were still tons of story to be told. They didn’t need to all have monsters tied to them. I watched the show for the characters and the situations they found themselves in; those situations didn’t have to all be over the top supernatural. Thanks. There were ways they could go. I’m not sure why they felt they were locked in from lifting stories for horror and gothic classics. I really like the fact that your story ideas do not require time travel; they involve the core anchor characters. Barnabas and Laura didn’t require time travel either, both using the standard soap opera tropes of the long lost relative and missing mother respectively. Daytime dramas are at their zenith when they are character-driven and, at the other end of the spectrum, at their worst when they focus only on grinding out plot after plot after plot…There are many reasons why there are so few daytime dramas left on television but I have always maintained that once they began focusing on gimmicky storylines, they lost a lot of viewers. If the viewers don’t have a stake in the characters, then they begin to drift away. I always thought that’s why the Leviathan storyline flopped – we went from Lovecraftian creatures to vampires old and new to werewolves to a visit to the Underworld to a witch and a warlock to a ghost out for revenge to zombies rising from the grave – it’s a wonder a mummy didn’t come lurking in before it was all over. As a result of all this “let’s see what sticks” writing, longtime characters such as Roger Collins got tossed to the sidelines while Jeb couldn’t seem to decide if he was more frightened of ghosts or werewolves or shadows. Someone pointed out previously in a posting about the Leviathan storylines that it was hard to care about Philip and Megan Todd when they were just plopped into the show and then suddenly became foster parents for baby Jeb – it would have been more engaging to the audience, as the commentator remarked, if Jeb’s caretakers had been a newly-married Joe Haskell and Maggie Evans. The surprise half-brother needs a mother. And the show is new again. 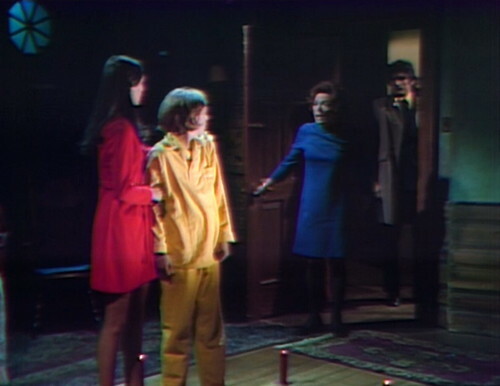 Maybe Barnabas could depart, and Frid plays the surprise brother. Lara is the greedy wife and get the guy who played Jeremy Grimes to play the son. Millay and Thayer David are the wife’s parents, who are so awful that Liz, Roger and the brother team up to get rid of them. My guess is that they were already behind the scenes building the Judah Zachery backstory and just needed to blast through this shite–kill everyone–to get there. Watch Re-Animator to see how great Judah Zachery could have been if he opened his eyes more than once every two episodes. Damn, I want to take a time machine and talk my way into becoming writer #3 with a sheaf of notes from Danny Horn. I’ve never understood this. Why does Daphne need to come to the Old House with Julia? Julia has an office there at Windcliff. And so what happens during the 100 mile drive from Windcliff to Collinsport? They just sit in the car and don’t talk? A lot of shows do that, waiting for the characters to get to the next set before talking resumes. Maybe they had trashed Julia’s Windcliff office set, hence the long drive to the Old House tight lipped. Two children, who’ve been found to have high fever, yet strange to say there’s no staff seeing to them – despite Julia’s promise to Daphne that they would be well cared for. Didn’t she mention to anyone that they might try to leave? How did the children get their clothes back? The AMA should be looking into this facility. Still, I don’t suppose the medics are to blame; apparently these two kids are FAST! They’ve managed to travel from Windcliff to Eagle Hill, on foot, in only an hour or so. But since both locations have been “migratory” in the past, perhaps they’re now only a few yards apart. But there was a bit of plot crossover, finding the vampire’s coffin – though wouldn’t the children know that the crypt was Roxanne’s from 1840? I’m not sure what time it’s meant to be, but the children appeared to be traveling at night. Isn’t the vampire rising a bit late? Shouldn’t the vampire have heard the children talking, or is that casket soundproofed? And as usual for unused burial chambers at the cemetery, there’s a torch burning. But thanks and praise be, Gordon Russell’s decided to get this story over with. Rose Cottage gets torched tonight! I’ll bring some frankfurters, you bring some buns, and I can stop and get some stuff for s’mores! Wave the green flag already! Roxanne’s tomb in 1840 looks nothing like the one she uses in the present. His ego and self-importance most likely. His backstory is explained in the audio Dreaming of the Water, through a framing sequence that takes place after his character leaves the show. I think the staff is a bit lax. I mean, Maggie and Liz escaped from there a few years earlier. And they also made it to Collinsport in about an hour. Fast walkers! Liz walked the entire way in her slippers. Hitchhiking was big in the late 60’s. The truckers along the Windcliff to Collinsport route were probably used to seeing heavily sedated, pajama clad Collinses on the side of the road at 3 a.m. – with their thumbs out. I like to think that there was an intermittent timespace vortex that wormholed right to Collinwood. Ha! Elizabeth Stoddard was one tough dame – She could maintain her dignity no matter what the circumstances. She would have gladly hitched a ride in an 18 wheeler, a leaky old row boat or a chicken truck if she was determined to get home. Elizabeth Collins Stoddard could make a semi into a limousine, a leaky dinghy into the Mauretania, and a poultry truck into a Rolls Royce. I know I’d give her a lift, even if it was out of my way. Don’t forget Amy, who had never been to Collinwood before. Somehow she escaped and found her way into the Collinwood grounds, just in time for her to be found, taken pity upon and to discover an antique phone. Now you mention, the “escapees” have all been women and children – perhaps, in typical chauvinistic fashion, only adult males are monitored at Windcliff (which explains why Joe and Willie didn’t manage to vamoose).